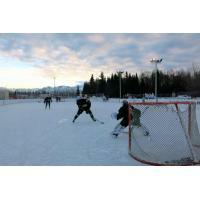 ANCHORAGE, AK - The Aces took the game outside Wednesday morning for a final go-round before embarking on an east coast road trip. Coach Rob Murray divided the team into black and white squads. They scrimmaged and generally had a great time on really good ice conditions at the Bonnie Cusack rink outside of the Ben Boeke Arena. The Aces leave Thursday morning for Atlanta and the start of a six game road swing through the southeast US. All games can be heard on 103.7 FM and 750 AM KFQD. The Aces return home to face the Idaho Steelheads in a 3 game series starting Friday, January 22. For tickets, stop by the Aces ticket office at 15th and Gambell Monday through Friday 9am to 5pm, or go online at www.alaskaaces.com.